I’ve had a couple of pieces published online in recent days: my review of new poetry books by Paul Batchelor, Oli Hazzard and Toby Martinez de las Rivas, which was published in last week’s New Statesman, has now gone online, and my short piece for Apollo magazine about Paul Pfeiffer’s Jerusalem, a work of online art about the 1966 World Cup final, was published today, just in time for the 2014 final. 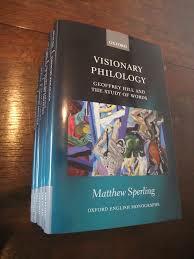 This entry was posted in Department of English Literature news and events and tagged Department of English, Department of English Literature, Dr Matthew Sperling, English Department, English Literature, Geoffrey Hill, Ian Duhig, Reading, University of Reading, Visionary Philology. Bookmark the permalink.